At Trumer, we provide a working environment that encourages staff empowerment which gives you the opportunity to develop and realise your full potential. We are currently in search of dynamic, enthusiastic and innovative individuals with great team spirit to join us and be a part of our ever growing team. For every merchant or member recruited, you will be handsomely rewarded. Whenever these merchants and members buy or sell, it will bring revenue to you and your team. Apart from that, you will get to enjoy job satisfaction. Only short-listed candidates will be notified and invited to attend an interview. Rest assure, all applications are kept Private and Confidential. Recruit Merchants or Retail Outlets to take part in the Merchant Discount Program, as per our Current TrumerX Programs listed on www.trumerx.com. List and maintain product details that are sold by merchants on www.trumerx.com. Follow up with merchants on the buying and selling activity of their products and services listed on www.trumerx.com. Comfortable with the flexibility of being self-employed (with no capital outlay). Possess a large network of contacts and is able to 'capitalise' them accordingly. Able to work anywhere and anytime, at your convenience. The opportunity to be your own boss, as our Business Partner. Must possess own mobile device such as smart phone, notebook or laptop and wireless broadband. Must be 18 years of age and above, male or female. Able to converse in English, Bahasa Malaysia or Chinese. Self-motivated and a goal oriented team player. Resourceful and able to work independently. Wisma Dicor, Jalan SS 17/1A, 47500 Subang Jaya, Selangor. Preferred office location, nationwide (Indicate your preferred location and postal code in order to service the merchants that has been recruited by you). Recruit Merchants or Retail outlets to take part in our TrumerX Programs listed on www.trumerx.com. Follow up with Business Partners on their progress and so on. Must have at least a Diploma or a Degree or anything of its equivalent. Must possess own mobile device such as a smart phone. Strong interpersonal skills and able to work as a team with Business Partners. Must possess a minimum SPM/O levels qualification. Candidate must be between 21 to 45 years of age, male or female. Responsible for sourcing new products that is highly demand driven by buyers on TrumerX. List and maintain product details that are purchased from merchants on www.trumerx.com. Possess at least three (3) years working experience in the related field. Have basic experience and knowledge when it comes to purchasing merchandise for the TrumerX website. Resourceful and self-motivated, able to work under minimum supervision and good at multitasking. Required basic skill(s): MS Office Excel or Word. Able to handle full sets of accounts. Be in charge of daily accounting duties. Take responsibility for other ad-hoc duties, as and when required. Possess a diploma in Accounting or any other major of its equivalent. Good in co-ordinating, able to prioritise and work well under pressure. Open to all Malaysian citizens. Jalan SS 19/1G, 47500 Subang Jaya, Selangor. Responsible for all incoming phone calls. In charge of office Admin duties including handling of Incoming and Outgoing mails. Assist in data entry and filing of documents. Help out with ad-hoc duties as assigned from time to time. Must be a Malaysian citizen with a pleasant personality. Possess an SPM qualification or anything of its equivalent. Fluent in English and Bahasa Melayu. Have at least 2-3 years working experience. In charge of monitoring and tracking delivery of placed orders. Assist in sourcing for price quotations and other ad-hoc duties, as and when required. Being familiar with areas in Kuala Lumpur and the Klang Valley is an added advantage. If you want to develop a rewarding and high paying job in retail sales. 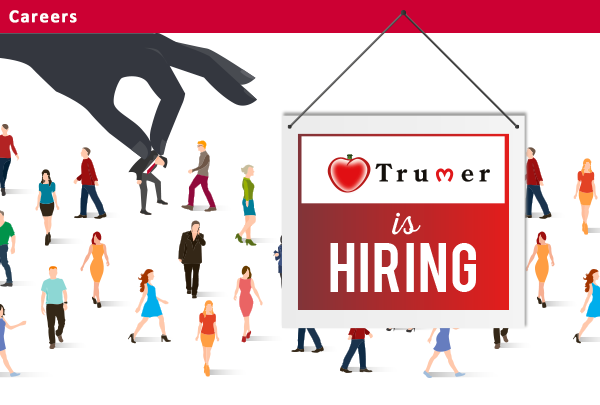 If you are passionate about demonstrating or promoting the use of TrumerPay, a mobile payment system. If you have a keen interest in cashless payment systems. Offer product demonstration or support to walk-in customers or product enquiry to customers over the phone. Provide assistance to customers to complete payment. Maintain the brand and store’s overall professional presentation. You must possess a minimum academic qualification in SPM / STPM / "O" Level. Experience not required. Training will be provided. You are a people person and customer service is what you enjoy doing. You are a dynamic and sales-driven individual with excellent communication skills. Recruit merchants and members to be part of Trumer International Berhad. Assist in executing all sales and promotional activities to ensure all sales targets are met. Follow up with merchants on their trading activities and provide support to ease business flow. Fluent in English, BM or Mandarin. Self-motivated, goal oriented team player. Wisma Dicor, Jalan SS 17/1A, 47500 Subang Jaya, Selangor, Malaysia or any locations as per required. Provide merchant and member support to ensure demands are satisfied. Coordinate and monitor sales personnel’s and promoter’s schedules. In charge of monitoring account managing performance. Able to lead and work well under pressure. Wisma Dicor, Jalan SS 17/1A, 47500 Subang Jaya, Selangor, Malaysia or work from home.